A new and apparently very useful tool called MODIFI3D has launched a crowdfunding campaign on Kickstarter backed by a company called Steelmans that has over 30 years manufacturing experience. The tool is intended for everyone using FFF/FDM 3D printers for printing to help them clean the printed 3D model from support material leftovers and help in even improving some details that might need some postprocessing work. 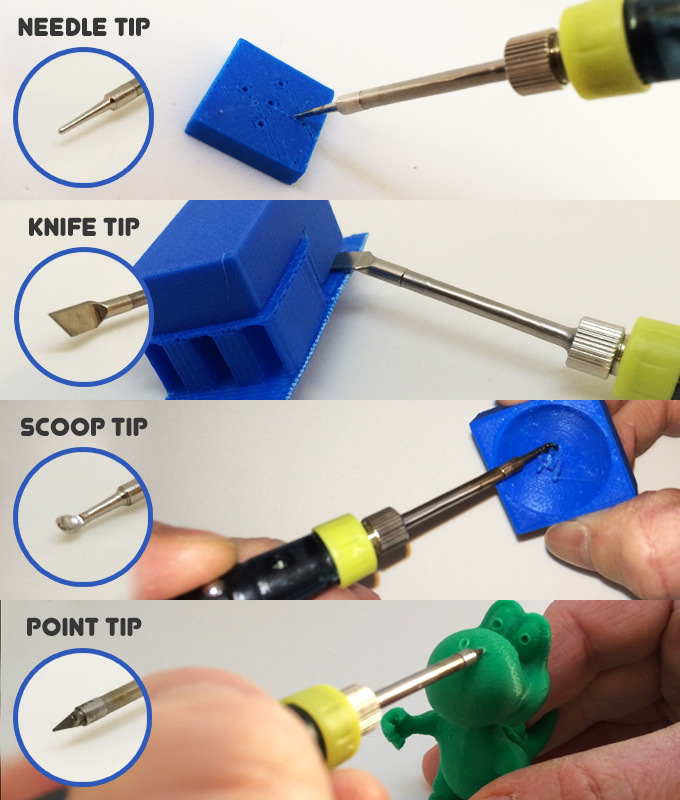 MODIFI3D is a heated tool with interchangeable tips designed to finish, repair and modify 3D printed parts and is much like a small soldering iron with specialized set of tips. It has been designed to replace some of the sanding, scraping and snapping often needed to finish off your 3D prints and comes with 4 interchangeable tips – needle, knife, scoop and point tips. MODIFI3D is going to be affordable and very useful with early bird Kickstarter pricing of just 10 UK Pounds (about $15 USD or 14 Euro) and a regular pricing of 15 UK Pounds or about $23 USD or 21 Euro. According to the project page the first 300 early bird backers will get their tool in January and regular backers should have the MODIFI3D tool in their hands some time in February 2016, so not much waiting.